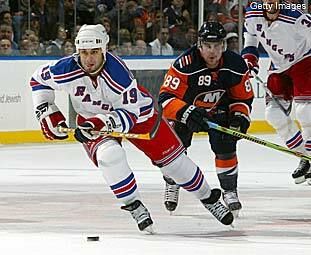 Scott Gomez and the New York Rangers look to avenge Tuesday night's shootout loss against Mike Comrie and the crosstown-rival New York Islanders tonight at the Nassau Coliseum. With nine games in the NHL, Thursday is a busy night that will have playoff implications. At 7 p.m., the Toronto Maple Leafs visit Boston, the Rangers finish their home-and-home battle with the Islanders, the Philadelphia Flyers host Tampa Bay and the Minnesota Wild travel to Carolina. Later, the Pittsburgh Penguins battle the Florida Panthers, the surging Anaheim Ducks play the Colorado Avalanche, the Montreal Canadiens make a rare trip to Phoenix, the Nashville Predators continue their six-game road trip in Vancouver and the Ottawa Senators play their last of three Californian games in Los Angeles. * Toronto defenseman Tomas Kaberle, whose brother Frantisek is a defenseman for the Hurricanes, has 12 assists in his last 13 games, but he hasn’t scored a goal in 22 games. * Boston left wing P.J. Axelsson, who leads the team with a plus-12 rating, has one goal and one assist for two points and a plus-3 rating in four games against the Maple Leafs this season. Axelsson, who is one of the League’s premier defensive forwards, leads the team’s forwards with an average of 3:27 of shorthanded ice time per game. * Rangers goalie Henrik Lundqvist, who was selected No. 205 overall in the 2000 Entry Draft, has allowed six goals while facing 26 shots in his last two appearances. * The Islanders, who have allowed the most goals in the Atlantic Division with 196, have lost two of their last three games and find themselves three points out of a playoff spot in the Eastern Conference. * Tampa Bay defenseman Dan Boyle, who leads the team with an average of 27:34 of ice time, has a minus-7 rating in his last four games, including a minus-4 effort Saturday in Tampa Bay’s 5-1 loss to the Hurricanes. * The Flyers, who have one regulation loss in their last five games, have scored the most goals in the Atlantic Division with 205. Philadelphia, which is in eighth place in the Eastern Conference with 74 points, has allowed the second-most goals in the division with 194. * Minnesota goalie Niklas Backstrom, whose favorite breakfast food is oatmeal, has won three of his last four games and has allowed more than two goals just once during that span while facing a total of 128 shots. * Carolina, which is in first place in the Southeast Division with 75 points, is 6-2-1 since losing star center and captain Rod Brind’Amour for the rest of the season with a knee injury. * Since being traded to Pittsburgh along with star right wing Marian Hossa, right wing Pascal Dupuis has played at least 16 minutes in four games with the Penguins. Dupuis, who played for defensive mastermind coach Jacques Lemaire in Minnesota for six seasons, averages 2:38 of shorthanded ice time per game. * Florida goalie Craig Anderson, who has played just 13 games this season as the backup to Tomas Vokoun, has back-to-back shutouts and yielded just one goal in his prior start while facing 134 shots during that three-game span. * Anaheim center Ryan Getzlaf, who leads the team with 71 goals, has one goal and six assists for seven points but a minus-3 rating in his last six games. * Colorado, which is just three points out of first place in the Northwest Division, has won its last four games. The Avalanche, who are in the midst of a four-game homestand, have a 20-11-2 record at the Pepsi Center. * Montreal defenseman Mike Komisarek, whose father owned an auto body shop, leads the Eastern Conference with 242 hits. Komisarek, who averages 21:31 of ice time per game, leads Canadiens defensemen with a plus-7 rating. * Phoenix, which has a 5-3 record against the Eastern Conference this season, is just three points out of a playoff spot in the Western Conference. The Coyotes, who play in the Pacific Division, which is the only division with three teams that have at least 80 points, have a 16-7 divisional record. * Nashville goalie Dan Ellis has one regulation loss in his last 10 decisions. Ellis’ competition, Chris Mason, has won just one of his last six decisions. * Vancouver, which has lost its last four games, has slipped out of playoff position in the Western Conference with 74 points. * Since Ottawa fired coach John Paddock Feb. 27, the Senators have lost three of four games and are tied with the Canadiens at the top of the Northeast Division, but Montreal has a game in hand. * Los Angeles center Anze Kopitar, whose favorite action hero is Superman, has three goals and seven assists for 10 points and a minus-2 rating in his last six games.